Come and join us for our 5th annual Scholarship Fundraiser and Induction of Officers Dinner. The event will be held on Saturday, October 13 at the Marriott – Mission Valley. Please show your support! If you cannot be there, please consider purchasing raffle tickets. The tickets are $1.00 donation for each ticket. You don’t have to be present to win. Complete the CONTACT US form and specify how many tickets you would like. $50/members, $60/non-members or $500 for a table of 10. Raffle tickets are $1.00 donation. pay for your tickets via VENMO. Send payment to @FALEO-SD. Your tickets will be at the front door and a confirmation email will be sent to you. For raffle tickets, the confirmation email will have your ticket numbers. On Saturday, September 1st, FALEO – SD will be hosting a bus trip to the Golden Acorn Casino to help raise funds for the JD Scholarship Award. The cost is only $25 which will be returned to you as a player’s credit. FALEO-SD hosted our 4th annual scholarship dinner to present the Jonathan “JD” Deguzman Memorial Award. The event was held on Friday, September 8th at the Bonita Golf Course (5540 Sweetwater Road, Bonita 91902. On December 7th 2015 at 6:30 pm, FALEO-SD kicked off our 3rd annual Families in Need – Holiday Drive at the Eastlake Tavern and Bowl. Several members stopped by to drop off cash, gift cards, canned goods, and toys. Free bowling and shoes were provided by Eastlake Tavern and Bowl manager Leah Knight and Tavern & Bowl event coordinator Jennifer Lennig donated 2 free lanes and shoe rentals to FALEO Members, family and friends who stopped by that evening. During the event and over the next few weeks, FALEO-SD Board members collected donations from family, friends, and local businesses. The 4 families selected (Bondoc, Miranda, Tapayan, & Orbita Families) received $100 gift cards for Target, Walmart, and Vons. FALEO-SD also donated dinner Baskets and 2-3 15-20lbs bags of rice to each family. The 4 students who were selected where also given $45.00 gift cards for Toys-R-Us. With the help of NCPD SRO Gil, S. FALEO-SD was also able to donate 4 brand new bicycles. On the early morning of December 20th, 2015 FALEO-SD met at the National City Police Department to sort out the donations and gifts. FALEO-SD was fortunate to have over 25 people participate in delivering the Christmas spirit to the 4 families within National City and San Diego communities. Thank you to the FALEO-SD Board, families and friends who assisted in the deliveries. The San Marcelino Zambales International (SMZI) volunteered with singing traditional Christmas songs and live music on each stop. NCPD cadets were also on hand to help. The event was also shared on channel 10 news the same night by reporter Melissa Mecija. 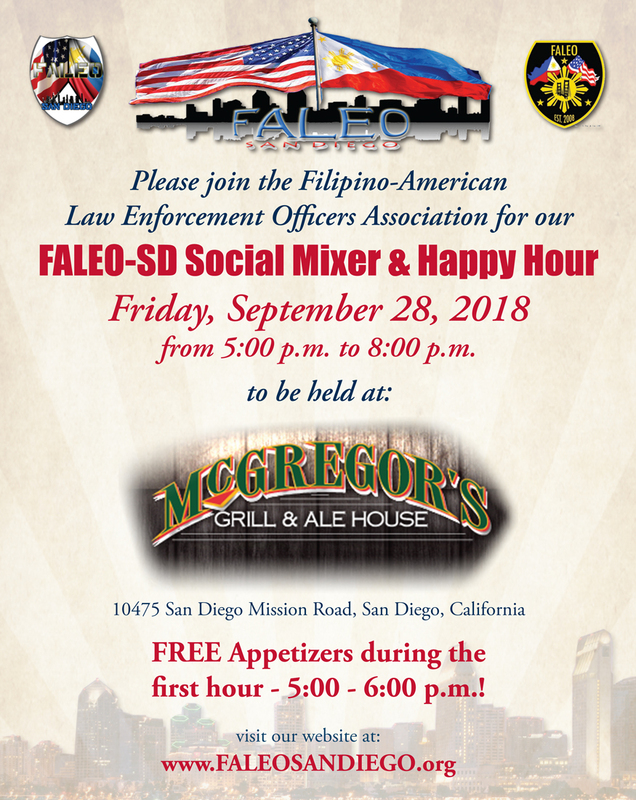 FALEO-SD appreciates the kind donations, help and participation. FALEO-SD looks forward to making the 2016 Families in Need – Holiday Drive successful as well. Thank you!